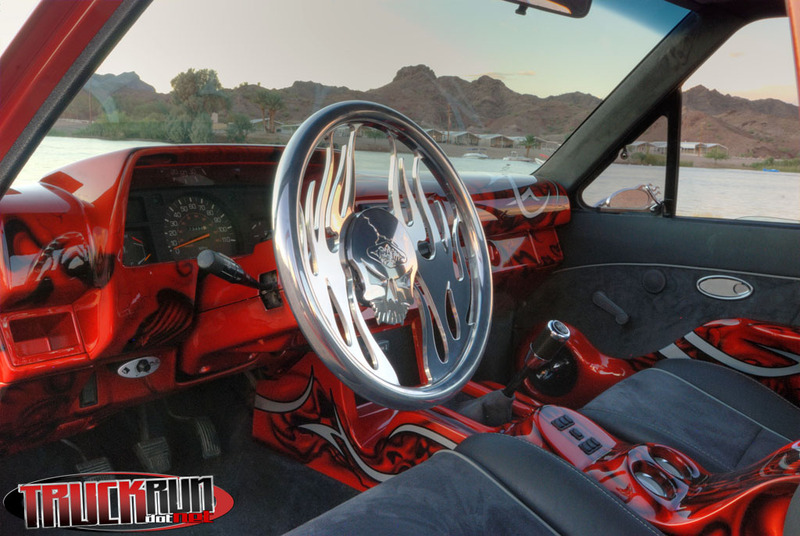 There comes a time in a custom truck owner’s life, as they jump into their next project, that they look back at past builds and reflect on what they learned and make decisions on the next build. Dan Gilliland did just that. After having a full show 98 Tacoma he decided that his next ride, an 87 Toyota XTRA-CAB Long bed, would be a simple and cool daily driver. Sometimes our closest friends can persuade us into to deviating from our best laid plans. Such was the case for Dan. He had a strong influence from his closest buddy, his 6 year old son Trae. 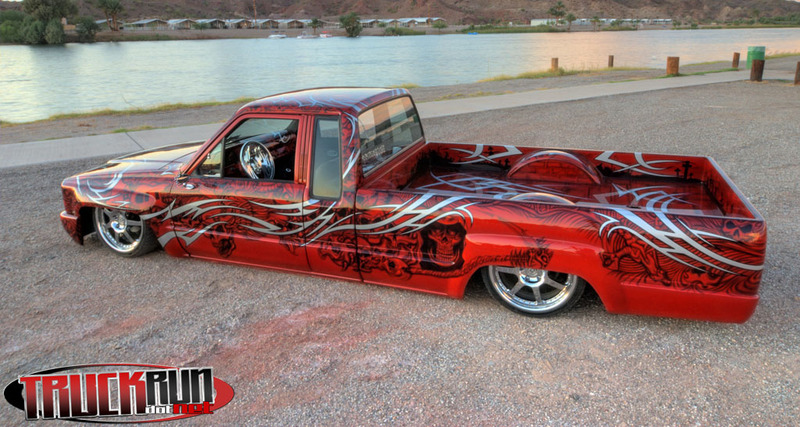 Dan’s plan was to just splash some fresh paint, add custom wheels and lower it the old fashioned way, by cranking the torsion bars in front and adding lowering blocks in the rear. 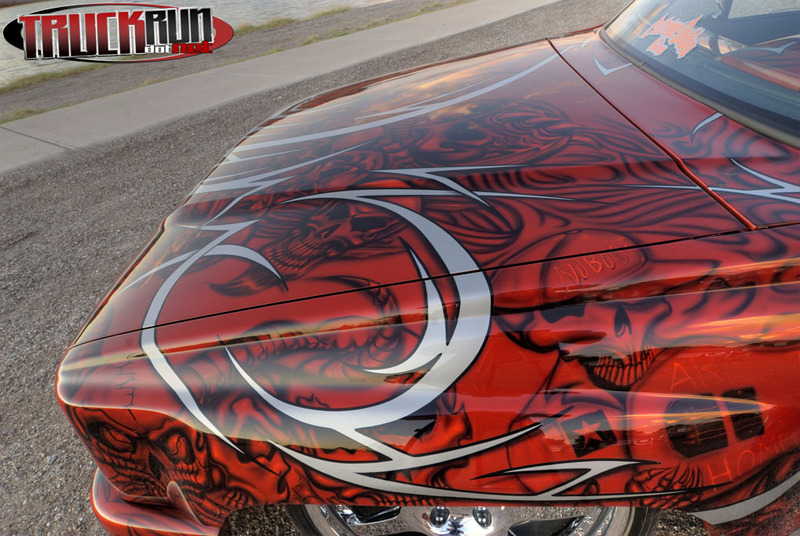 But Trae remembered the custom Taco and as he looked at the 87 he knew it was still lacking so he said the two words to Dan that would become the driving force in the build… “What’s next”? 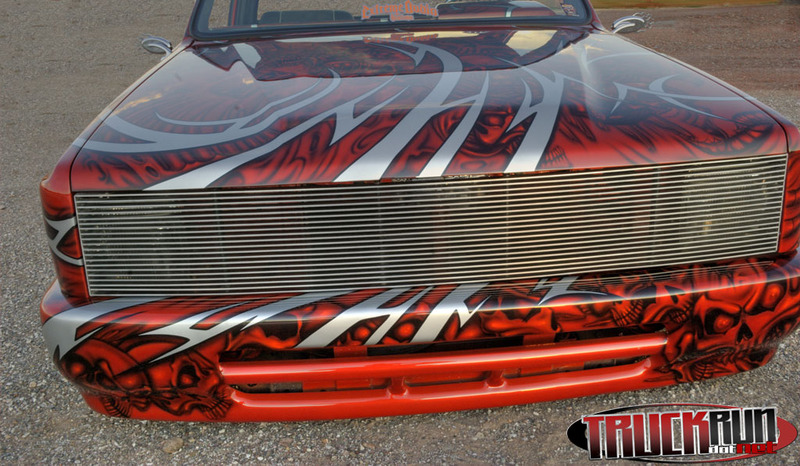 Every time Dan would add a new custom feature to the 87, Trae would give his approval and ask, “What’s next”? Dan had to step it up big. 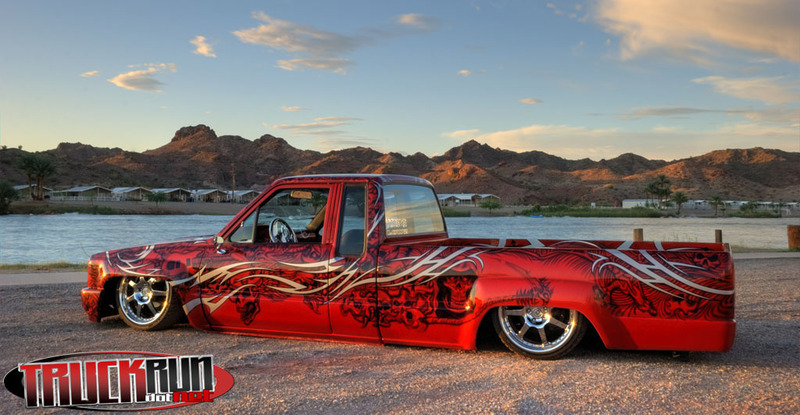 Not being a stranger to the custom truck scene, he knew what his next order of business would be if he was going to take this truck to the next level. He would have to get the 87 to sit lower to the ground. 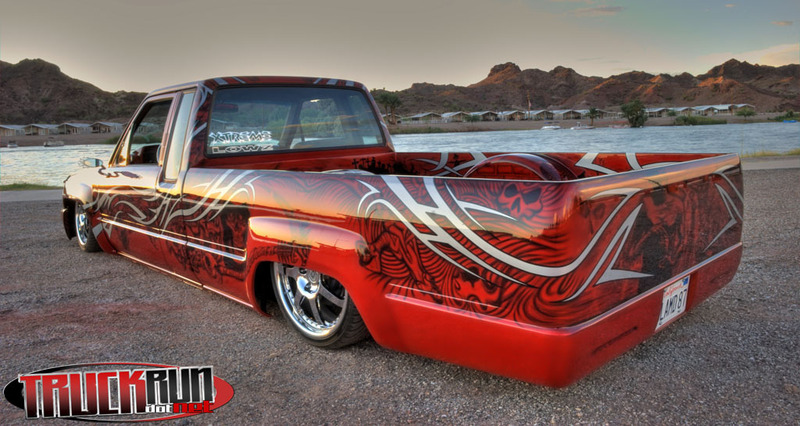 He decided to take it to one of the legends of the custom truck scene, Brian Jendro. Dan only had one request when he dropped off the 87; it was for Jendro to install a clean bag job. 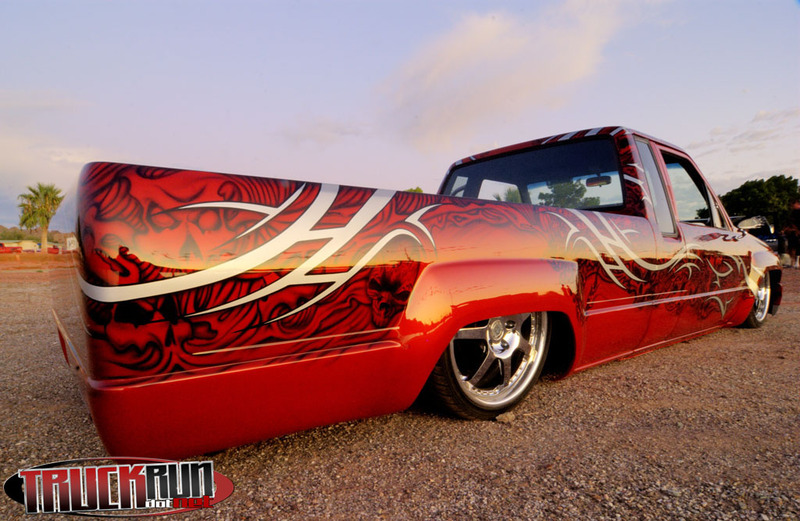 But Trae must have said those two magic words because halfway thru Dan had Jendro bodydrop the truck 2-3/4-inches and fabricate a cantilever rear suspension. 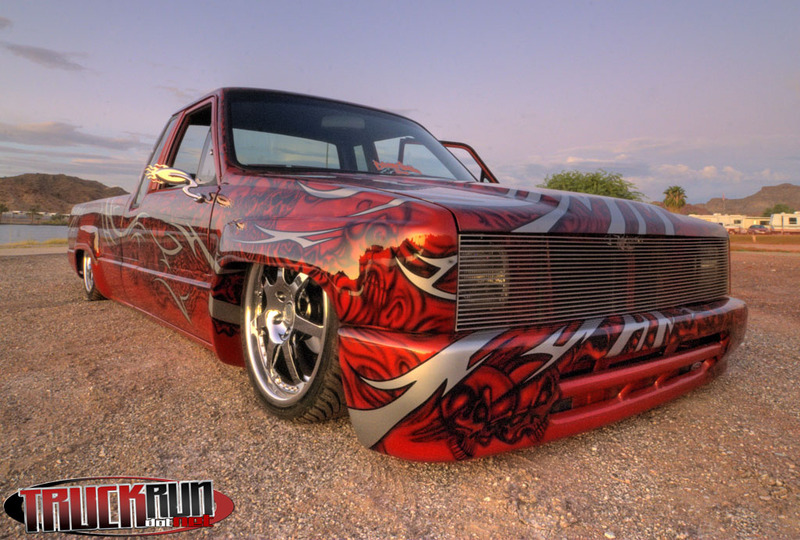 He also had him install custom control arms with Firestone bags that are filled by a pair of Viair 480C compressors. While Jendro was wrapping up the suspension Dan must have thought he would be ready for Trae’s question by asking Jendro to suicide the doors on the 87 but Jendro responded with a “NO”. Dan must have used Trae’s persuasive tactics because he convinced Jendro into doing the cool body mod one more time. He began to attend a few shows with his club Xtreme Lowz and he was slowly sucked into doing more and more. 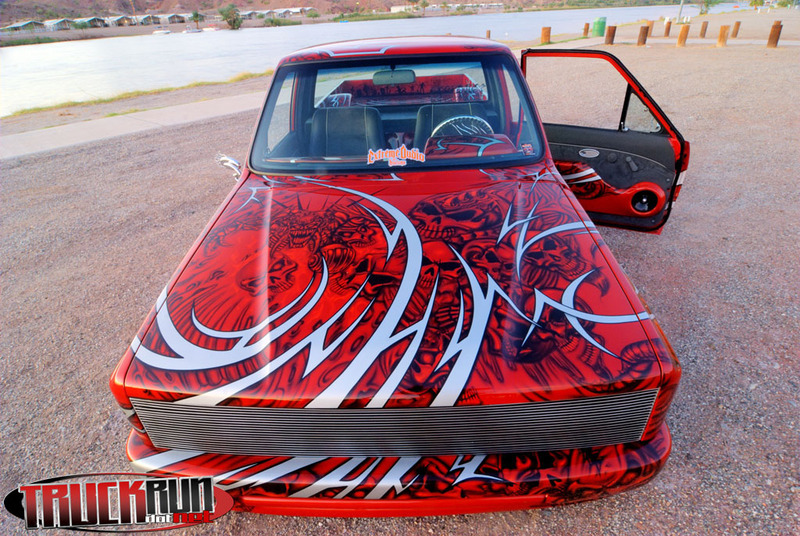 He had his fellow club member, Marley Marvelous, do the next list of custom mods by molding his front bumper and valance together, shaving the tailgate, taillights, turn signals, all handles, locks, hood squirters, wiper cowl, gas door and antenna. 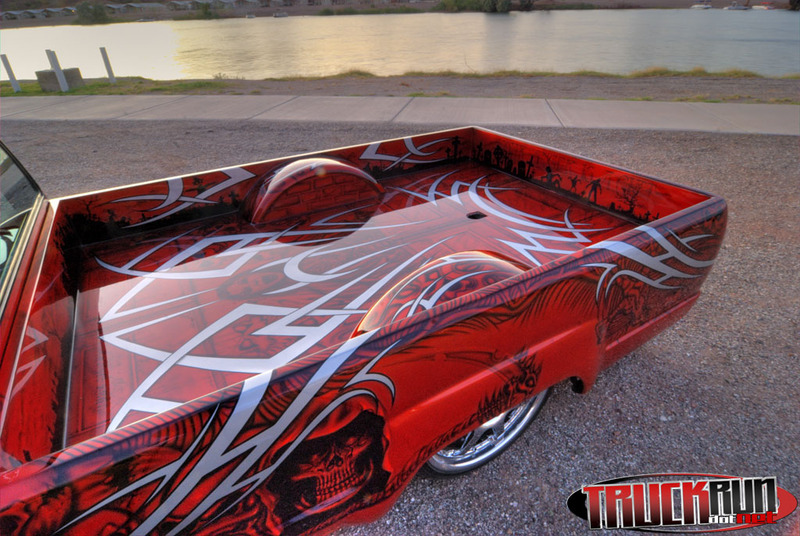 He also had Marley do a full sheet metal bed. At this point Dan knew that he had to pull out all the stops if the truck was going to meet Trae’s standards. 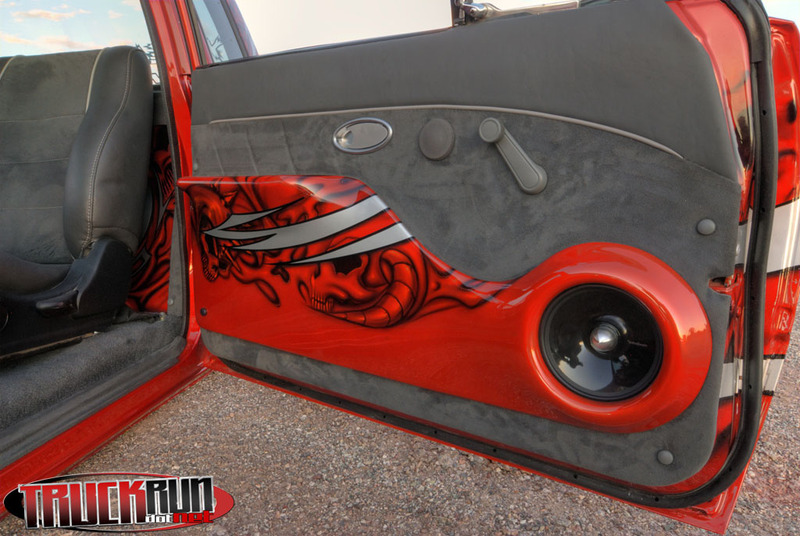 The truck's next stop was with another fellow club member, Joel Sadenwasser, and his shop, Extreme Audio and Kustoms. 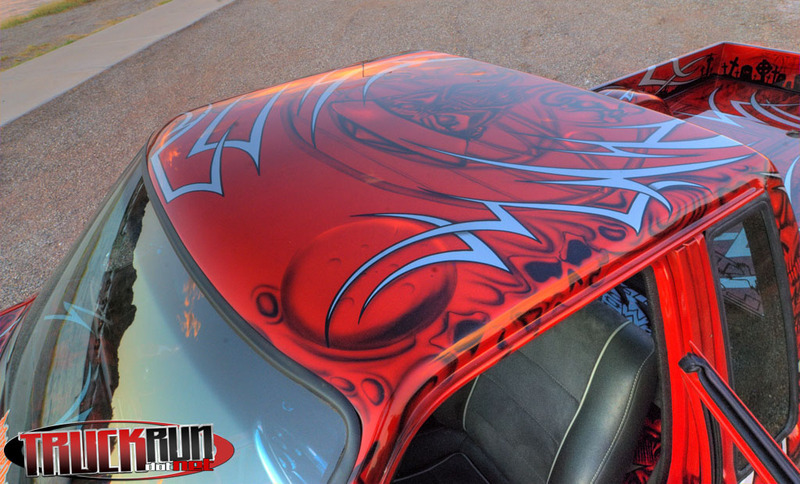 Dan wanted a crazy paint job at this point and also a custom interior to keep up with the exterior he had envisioned. 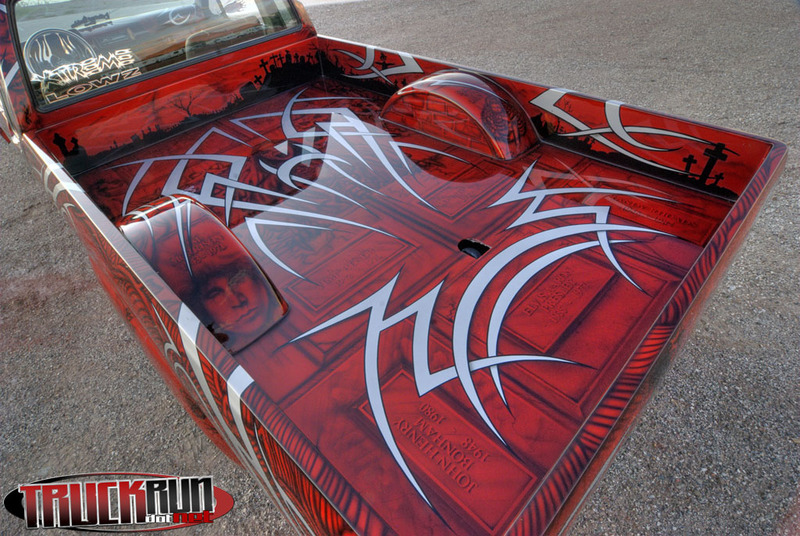 Dan had the idea to pay tribute to his rock and roll idols by having their images or names incorporated into the paint job. Joel knew the man that could do such a feat and introduced Dan to Alan Farias. Dan gave him the ok to go crazy and Alan did just that. Alan and Noel “Choforo” Flores at A.K. 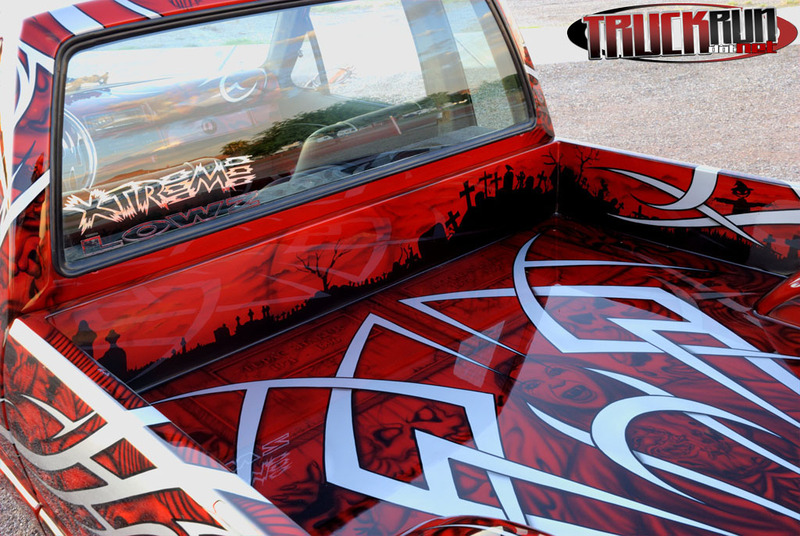 Airbrushing spent the next year painting the truck with SEM Coral Hyperbase, House of Kolor Kandy Tangerine, Transtar clear, and airbrushing it with PPG silver inside and out, including the engine compartment. 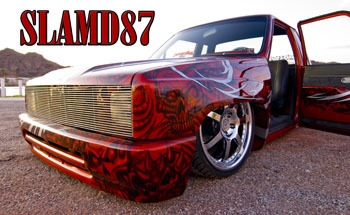 Finally, Joel and Adam Radovich got their hands on the 87 to wrap up the interior and stereo duties. 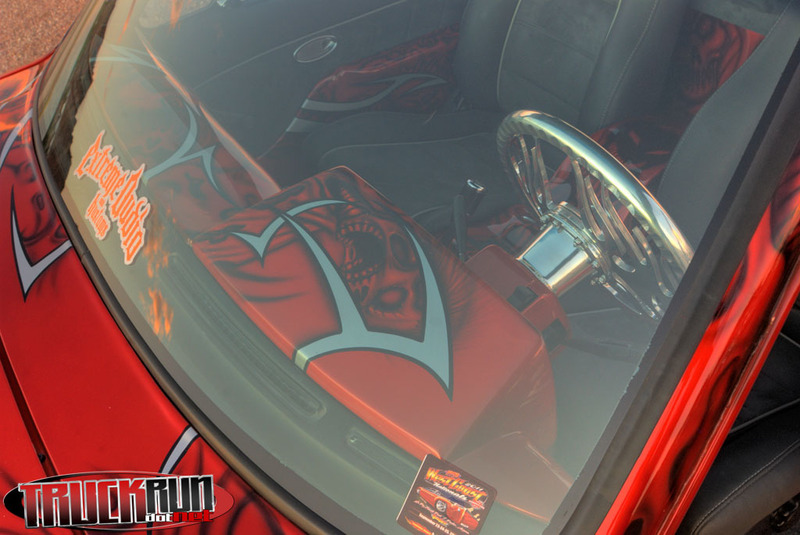 They wrapped the custom mounted Celica seats, custom door panels and smoothed and painted the dash. They topped this off with installing a B.A.D. billet steering wheel. 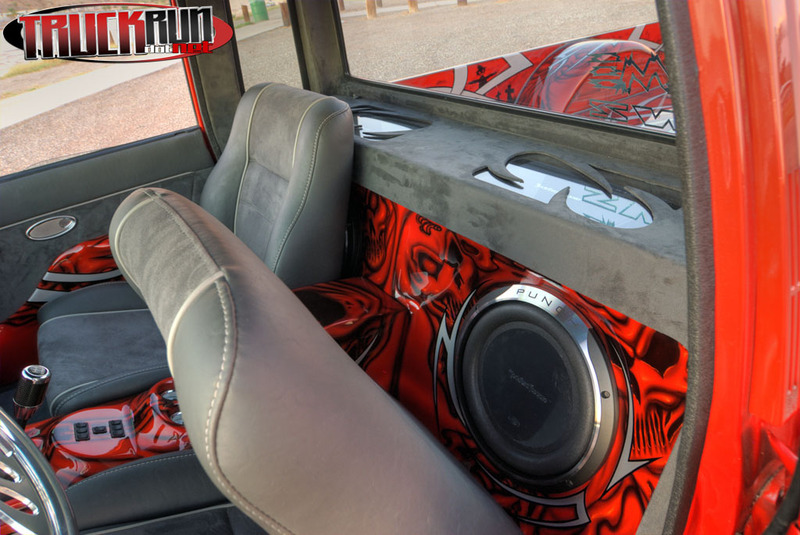 Adam and Joel also applied their talents to the stereo system with an Alpine head unit, Fosgate highs, mids and Subs as well as Fosgate amps to crank out those heavy metal tunes. Dan’s last task was to mount a set of Hankook tires on the 18-inch HRE-598-R wheels. 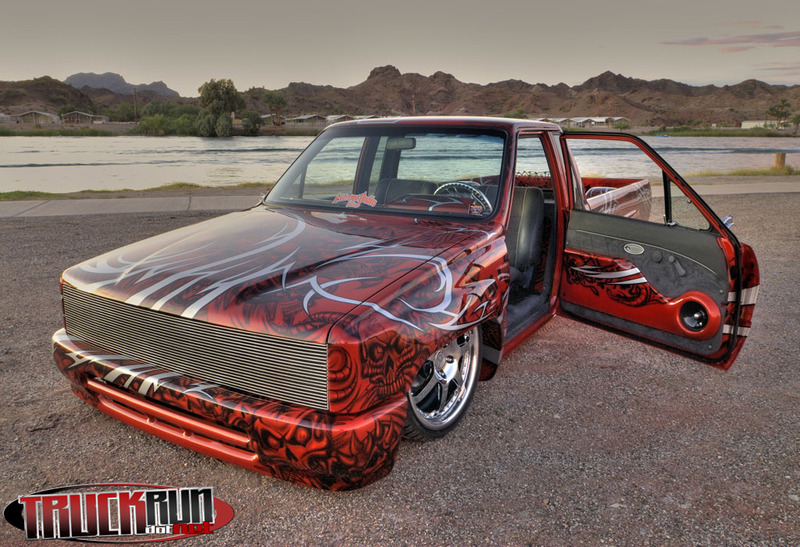 He bolted them on the 87 with just a one day to spare before heading out to West Coast Nationals ’11, where we shot the truck. Trae’s ear to ear smile when he goes for a cruise with his dad in the 87 is an indication that the build met his satisfaction. Now Dan is using the truck as incentive for Trae to stay out of trouble and get good grades in school so that when he graduates he can get the keys. 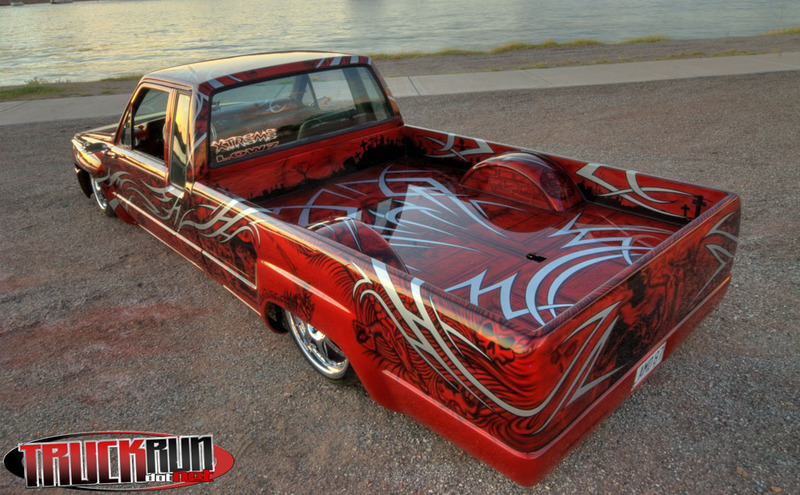 Say what you will, but that is more than enough reason for a father to build a cool truck with his son by his side. Dan would like to thank: Alan Farias and Noel Flores from A.K. 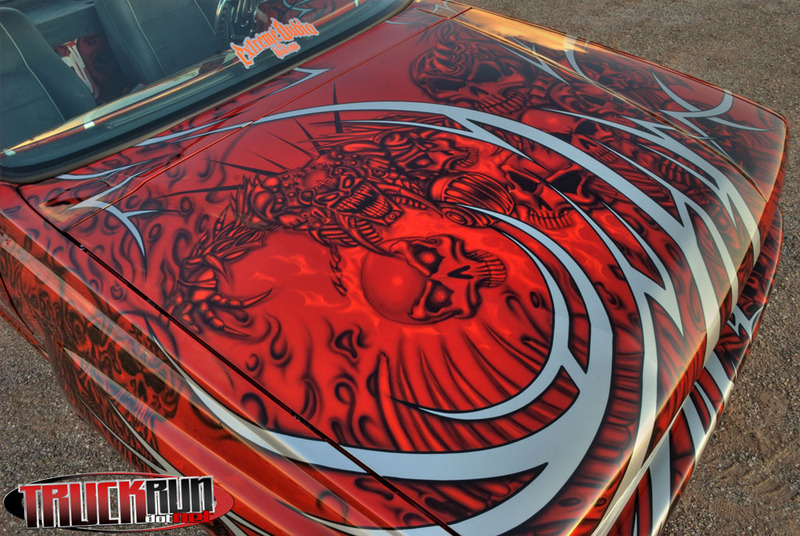 Airbrushing, Joel Sadenwasser and Xtreme Audio, Adam Radovich, Temecula Valley Paint, Brian Jendro, Marley Marvelous, Germain Smeyres, Robert Ramirez, his mother Marilyn Mukomela, and his son, Trae Fisher, for being patient.